Today, I have a great debt payoff story from Val Breit. She paid off $42,000 in student loans in 34 months, while earning $36,000 per year. Below is her story. Enjoy! For the first time, I was selecting my own student loan lender to help pay for my graduate school tuition. After seeing the chart that explained the $50,000 I projected to borrow for college would actually cost me nearly $100,000 to repay, I cried. Hard. I knew I was not going to earn very much as a school counselor, so I felt like this was a death sentence. I was going to be paying off this student debt forever. After this harsh reality slapped me across the face, I got my act together and decided I was going to do whatever I could to avoid paying that horrifying $100,000 amount. After 6.5 years, I graduated with a 4.0, a master’s degree in school counseling, and over $42,000 in debt. After consolidating, my loan servicer put me on the standard 20-year repayment plan, but I knew there was no way I was going to be paying for my college education that long. In fact, I completely repaid those student loans, plus the 6.8% interest, in just 34 months—less than 3 years after graduation day. I was offered quite a bit of financial aid, and it was tempting to take all that I was offered. During graduate school, I was offered about $20,000 per year in financial aid—even though tuition was only around $8,500! I easily could have ended up with $100,000 or so in college debt. Thankfully, I already had my “aha” moment (see the tears story above) and knew how much that borrowed money would cost to repay. So I figured out exactly how much I needed to cover tuition only and declined every extra dollar I was offered. This kept my total loan amount under $50,000. Instead of looking short-term and how I could get away with the lowest payment each month, I looked at the total amount I would repay if I selected the standard, extended, or income-based repayment plans. I chose the standard repayment plan because it you save the most money in the end. 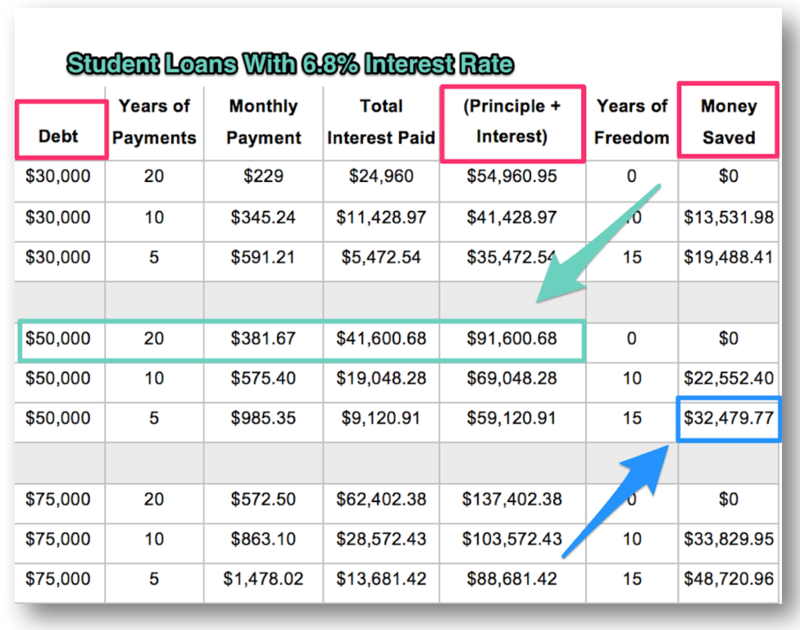 I also calculated and compared the total amount I would repay (principal + interest)—and how much I could save—if I paid off my loans at a faster rate. 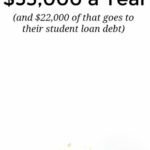 I was predicting to graduate with $50,000 in loans, and I realized I could save over $30,000 if I paid off my loans in 5 years instead of 20! For someone who was only going to earn $36,000 per year, a savings like that was impossible to ignore. Check out the chart below to see for yourself. I looked at the amounts I owed each lender and figured out what the interest rates meant. Most of my loans were Direct unsubsidized loans with a 6.8% interest rate, while a couple were at a much lower 2% interest rate. Using a repayment calculator, I realized I’d save the most money by using the debt avalanche method to tackle one loan at a time, starting with the highest interest rate loan first. You knew that b word was coming sooner or later. Yes, I created a detailed budget to help tackle my debt. It was my plan for how I was going to spend my money each month. I compared my projected income to my monthly bills to see how much extra I could find. I studied each expense to find ways to be a money saver. I continued to budget throughout the time I paid off my loans (and I still do a monthly budget to this day). Before I made any debt payments, I saved $1,000 as a small emergency fund. This was a comfortable number for me as a safety net, and I was strict about only using it for true emergencies. 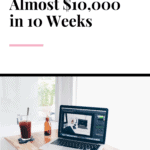 It got me in the habit of saving, and I knew once I had more than $1,000 in my bank account, then I could continue saving and start chipping away at my debt. Using my budget and a prepayment calculator, I set what I thought was an ambitious SMART goal: I wanted to pay off my biggest loan, which was about $38,000 at a 6.8% interest rate, in 8 years. My method was to reserve an extra $200 each month from my paychecks. When I first looked at my budget, that was the most I thought I could afford. And although 8 years seemed like a long time, it was a lot shorter than the 20-year repayment plan I was on. Most of my loans had a 6- or 9-month grace period before my first bill was due. But I started working full-time as a school counselor, earning a $36,000 per year, right away after graduation. Instead of using this money to buy clothes, furniture, or a new car, I started making payments toward my student loans. Since interest wasn’t accruing yet during the grace period, all the money went directly toward the principal. This is how I shrunk the principal of my loans before interest started piling on. I consolidated all my Direct loans that were around 6.8% for a 6.75% interest rate. I did not consolidate the Direct loans that had a 2% interest because it would have resulted in a higher interest rate. Since I only had my loans for a few years, this probably didn’t make a huge difference. But it did move a bunch of smaller loans into one big chunk for me to tackle. If you can get a lower interest rate though by consolidating, then it might be a smart money move for you too. Once my payments were due, I set up automatic monthly payments so I’d never miss a payment and I got a small interest reduction (.25%). But instead of the minimum payment, I set this automatic withdrawal to include the extra $200 I needed to pay in order to meet my goal. This made my total monthly payment about $450. Instead of looking at this as an “extra” payment, I acted as if it was a real bill for $450, just like my rent or electric bill. That way I wasn’t tempted to spend that extra money elsewhere. I knew that monthly payment was the only way I’d reach my goal of having that big loan gone in 8 years (which was going to save me around $20,000 in interest). Despite my best efforts to set an automatic extra payment each month (step 8), my loan servicer just could not get it right. For several months, they only withdrew the minimum amount I owed, so I had manually make the extra payment online to stay on track. Then they started withdrawing my money on the wrong date. This was frustrating because with a budget as tight as mine, I couldn’t afford for $450 to come out a week early or late. I called customer service to get it straightened out, but after several painful calls, hours of being on hold, and months of extra financial stress, I finally stopped the automatic payments. I sacrificed the interest rate reduction because I kept the big picture in mind: I wasn’t stuck on saving .25% interest, I was aiming to save $20,000! The only way to do that was to make the extra payments each month, and I was not going to let the loan servicer’s glitch get in the way. I ended up putting the bill on my monthly calendar and manually made the $450 payment every single month. Every few months, I looked at my expenses to find more ways I could save money. It’s hard to believe, but I did not get a smartphone until after my student loans were paid off, even though it was something I badly wanted. I got teased by co-workers and it was incredibly inconvenient. I had to use my old school GPS to get directions, and I only checked my email or social media when I was at home on my laptop. But having a “dumb phone” with no data package saved me thousands of dollars, which helped me pay off my debt even faster. I drove a small, paid for car, so I did not have a car loan. I had a 30-minute commute to work, and the best gas saver of all was carpooling with a co-worker. Although carpooling wasn’t always convenient, it saved me a bunch of money each month on gas. I called my satellite TV provider, our internet provider, and our cell phone provider to see how I could lower my monthly bills. I was successful with the TV and cell phone companies, but I struck out with the internet company. And I hardly ever bought new clothes. On average, I spent $20 per month on new clothes. My old clothes weren’t trendy, but they fit just fine. And if there was a clothing item I really wanted, I gave it to my mom as a gift idea. I also found ways to save money on food. I planned my meals for at least one week at a time. I made a list of the groceries I needed for those meals, and I only went to the grocery store once per week. I cooked at home and packed leftovers for lunch. I politely declined invitations to go out to eat for lunch with co-workers. Although there were a lot of things I wanted, I wanted to be debt-free even more. Thus, I became very comfortable with contentment and delayed gratification. I knew this bare minimum lifestyle was only for a small time period, and the sacrifice would be worth it in the end. By continuously slashing my expenses, I was able to throw even more money at my student loans. 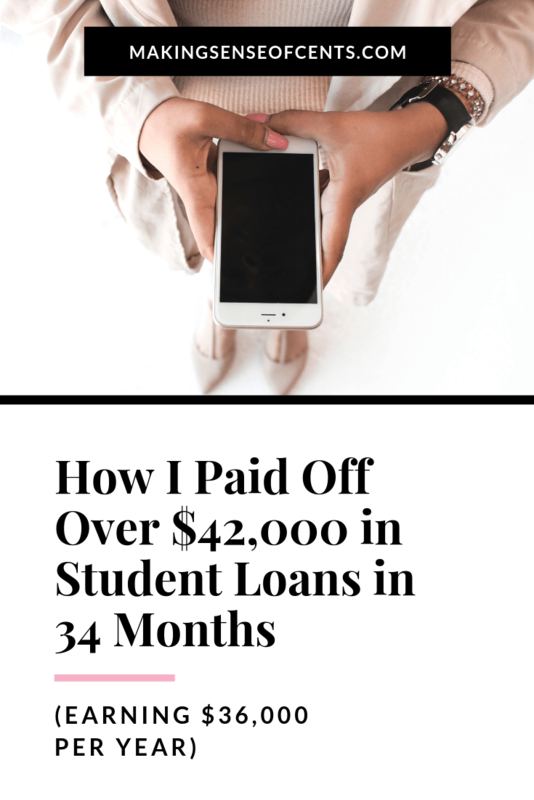 In addition to the $250 that was due every month, and the $200 extra I committed to paying each month, I often logged into my student loan account and made random additional payments. Sometimes it was only $50, but usually it was another $200 or so. Watching my student loan principal shrink was addicting and invigorating I was wiping out my loan faster than I ever thought I could. Besides cutting back my expenses, I also “found” extra money around my birthday, Christmas, and tax time. I often receive a check or cash as part of my gifts, and I often received money back from taxes too. Instead of spending this money on other things, I usually spent a little but threw most of it at my student loans. Sometimes this was disheartening, especially when my co-workers were going on spring break trips to Cancun, but I couldn’t ignore the money I would be wasting on interest. So I kept my eyes on the prize and knew I’d be free from my college debt soon. Step 14. Said “No” to more debt. I didn’t accumulate anymore debt during this time. I drove a paid for $9,000 car, and I used credit cards wisely, knowing I would pay the balance in full every month. Without car payments, credit card payments, or more wasted money on interest for these loans, I was able to keep more of my income free to tackle the one debt I was focused on. Step 15. Kicked Sallie Mae out! After 34 months of maintaining an extremely tight budget, consistently slashing expenses whenever I could, and making loads of extra payments, I logged into my Sallie Mae account for the last time. I made my final student loan payment and rejoiced. I was so jacked, I thought confetti would come spraying out of my computer…but no such luck. They just processed it like any other payment. I took a screenshot of the $0 balance just in case and celebrated myself. It had all been worth it and my plan worked, better than I had hoped. Instead of paying off my loans in 20 years, I paid off my debt in less than 3 years. Not only did this save me 17 years of making payments, but it saved me nearly $30,000 in interest too! What if you have more debt? If you have more student loans than I had, then it’s even more urgent that you get rid of your debt as soon as possible because your savings (or loss) will be even bigger! You can plug your numbers into a loan repayment calculator to find out your exact numbers. I often get asked if I’d have done anything differently, and I wish I had known about Credible, who could have refinanced my loans for me. I knew my interest rate was brutal, but the only place I asked about refinancing was my local bank. Since I didn’t have enough equity at the time, they had nothing better to offer me and I didn’t look anywhere else. Had I known, I would have considered refinancing with Credible. I’ve heard good things about this company from fellow student loan borrowers, and I could have saved even more money on interest had I gotten their lower interest rate. A second thing I would have done differently is pursued more side hustles to make extra money. I was on a set salary schedule for my job, and no matter how many hours I worked or how great of a counselor I was, I couldn’t earn more money. Therefore, I mostly focused on the money that was going out in order to spend as little as possible. But knowing what I know now about the endless opportunities to make money, I would have started more side hustles years ago. Then I could have eliminated my student loans even faster. I’m spreading the good news. I often hear people say they wish they could get rid of their debt or they wish they could afford to be a stay-at-home mom (as I now am). Most people who say these things earn more money than my husband and I do, and it’s simply lifestyle choices that are getting in their way. So I’m using my story as an example to show you can create the lifestyle you desire! For many of us, including Michelle and me, that first step was paying off our student loans. 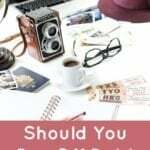 If you practice delayed gratification, budgeting, goal setting, and finding ways to cut back your expenses, you too can be a stay-at-home mom, a blogger living life in an RV, or whatever dreams you have. In my book, Pay Your Student Loans Fast, I describe the full details of all the things I did to wipe out my student loans. It’s easy to follow, you don’t need a huge salary, and it works for any kind of debt. Plus, there are 12 common mistakes you’re probably making with your loans that you’ll definitely want to avoid. Ready to achieve your dream? Take that first step and commit to getting rid of your student debt today. If I can do it, so can you. Who knows? It might just be the first step to livin’ your dream! Do you have debt? How much debt do you have? It all depends on how much you want something. If you want it bad enough, you will make the sacrifices to get it. The key is making a commitment, and then being persistent and creative in overcoming obstacles along the way. You got it. That’s why getting extremely clear on your “WHY” is a step I include for achieving any goal, financial or not. Once you know WHAT you want and WHY you want it, the HOW gets easier to bear. I have found that paying off student loans to be a task of determination and automation. Some of the point that I love from the author is automating your payments. Putting it on autopilot takes away a lot of the thinking. 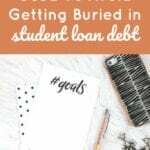 Also, it might be hard taking any gifts and putting it straight into your loans, but the freedom you get from not having the burden of student loans is well worth giving up that gift money. Delayed gratification > instant gratification! Delayed gratification is a huge part of getting out of debt and changing spending habits. With the easy access to student loans, credit cards, mortgages (debt of any kind, really), it makes it a lot harder to resist that instant gratification…get it now, worry about paying for it later. But when delayed gratification becomes your (new) norm, I’ve found it’s SO worth it and is a less stressful way to live. Yes exactly! Eliminating the amount of decisions you have to make in the day can decrease stress and anxiety tremendously, and also let you focus on the more important things. This was so motivational! I absolutely love your positive, level headed mindset! I’m so excited FOR YOU! Well done Val. It’s not easy to pay down a loan balance that’s larger than your salary in less than three years. It seems like you did just about everything right by minimizing the amount you borrowed and paying off the highest loan first. I’m a big fan of the avalanche method. If you’re serious about paying off your debt, reducing the overall interest expense with this method is a great way to do so. Thanks, Jason. It was crazy that I thought 8 years was going to be tough to swing, but once I got rolling, it became a challenge I had a love/hate relationship with. Hated the sacrifices but loved seeing the progress and principal shrink (and all that interest money I was saving). I was new to personal finance and didn’t understand why PF experts were recommending the snowball method. I understand it a little more now, but the avalanche method will always make the most sense. The numbers don’t lie! This story is so inspiring! All of these steps are super key to attacking debt. I’ve preferred the snowball method for debt payoff. It doesn’t make 100% sense math-wise but there’s some research around the effectiveness of using the way people *feel* about debt to help get rid of it. Getting past the anxiety of seeing that big balance is probably the hardest for some (it certainly was for me!). When I’ve spoken with some friends about their student loans, it’s as if they don’t even want to acknowledge it’s there, or have resigned themselves to paying it the rest of their lives. I’ve been there myself and it’s hard but sometimes, it takes a real-world example to show what’s possible for people to realize they can do it too. Thanks for sharing your story! My pleasure. I love to give hope, inspiration, and a real-world example of how to handle debt to others. Especially to those who are so overwhelmed they don’t want to acknowledge the debt is there…or how big it is. From what I understand, the snowball method works better for some because of the faster wins to keep people motivated and on track. 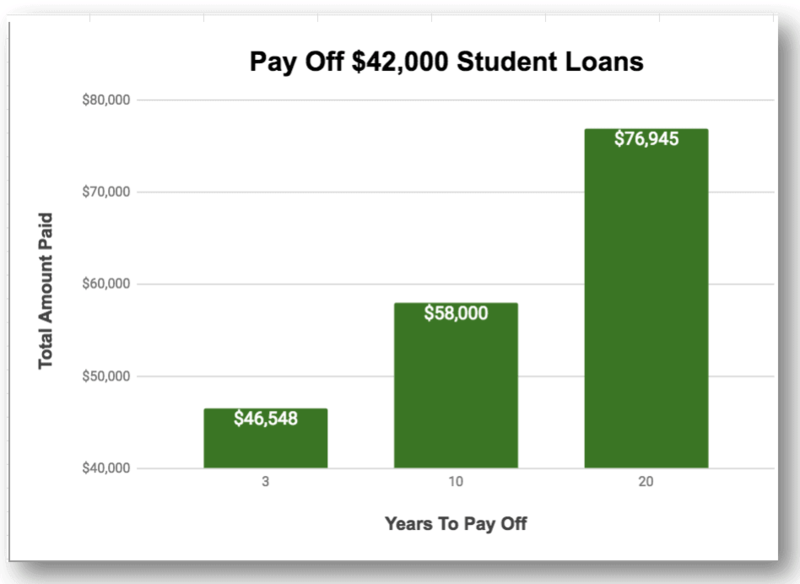 You see progress a lot faster paying off a $1,000 loan than a $30,000 one! While the avalanche method works better mathematically, either method ends in the same place: debt-free. Thanks for sharing your thoughts and experience too! Congrats on fully paying off your debt! I am also tackling student loans that are higher than my annual salary so your story is very inspiring. I am following a similar strategy as you (debt avalanche, 3 year payoff plan, making extra payments each month, cutting down unnecessary expenses). And I even had to forgo the 0.25% automatic payment incentive because my lender can’t get that right either! So I’m hoping I’ll see the success that you’ve had. Thanks for sharing your story! Wow, lots of similarities! Sounds like you’re on the right track. Keep at it and you’ll get there, Avery! I did that too with my zero balance! I took a picture and thought there would be a party. But it was just me and my computer. I have my zero balance letter up in my cube at work! I just had to double back and say paying off debt is a blessing. It not only gives anyone a piece of mind, but also puts you in a different mindset to help you have a greater respect for getting financially organized. Yes, money isn’t everything, but your financial situation affects all areas of your life. And that peace of mind without debt is priceless. This is awesome! Good for you! It’s not easy to pay off this much debt. You should be proud of yourself. Thanks! It did (and still does) feel amazing. To be honest, I feel even more proud when I find out a reader of my book or posts used my tips to pay off their debt. That’s crazy! There’s like no excuses if anyone in a similar situation read this. No excuses left! Haha, while there are similarities in every debt payoff story, everyone has their own unique way of getting.it.done! Amazing story! I’m a big believer in managing your personal finances wisely. Congrats on paying off your debt, and thanks for sharing how you pulled it off! Thanks, Kim! I loved hearing debt payoff stories when I was figuring out what to do with my mess, so it’s exciting to get to share my story with others. Cheers to being student loan debt free, it feels GREAT. Haha. And Sallie is NOT coming back! Cheers to you, Steph! She’s not an easy one to get rid of. I wish that I would have heard of Credible earlier before letting my wife use So-Fi to consolidate her student loans. I have to admit thought, their online community is great.